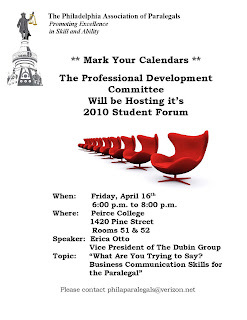 Tomorrow, Friday, April 16, the Philadelphia Association of Paralegals' (PAP) Professional Development Committee will be hosting its 2010 Student Forum here at Peirce College. Our very own Babette Pace, a Peirce graduate who is an active member of the PAP, happens to be spearheading the planning and organization of this year’s event. The event will take place from 6 to 8 p.m. in rooms 51 and 52 of College Hall (1420 Pine Street). Featured speaker Erica Otto, Vice President of The Dubin Group, a staffing and executive search firm, will share some insight about the importance of business communication skills for the paralegal, and how to market yourself in all your endeavors. The evening will include opportunities for Q & A, as well as a table with information about all of the current scholarships available to students in paralegal programs, and tips about how to write scholarship essays that put your best foot forward. This is a major networking event that brings PAP members from all areas of practice directly to the students. It is an opportunity for potential and current students and alumni to connect with paralegals in the field and get a real-world perspective, learning about the profession in general and what it is like to have a career as a paralegal. It is an absolutely terrific event for professional development, and provides students with the chance to hone their networking skills. We are excited to be able to provide the event space and welcome the PAP to Peirce! The pre-registration period is closed, but Babette has informed me that walk-ins are more than welcome. If you are interested in attending or have any questions about the event, please contact the Philadelphia Association of Paralegals.